Guitarist Jim Adkins has a wonderful new release called The Journey. I have been on the journey with this guitarist ever since I first heard his 2002 release Turning Point, a fantastic presentation of some of the best and smoothest compositions I’d heard to date. That CD still ranks extremely high with me, but I must say that this latest may well be his best display of hollow body and nylon string work thus far. Turning another page with sweet melodies now becoming the sweetest of melodies, the album is, from the lead track to the finale, a true masterpiece in my eyes. Impressive fluidity accompanies each piece here, and there is a sense that you could dance off into the night content with just having had the music as your dance partner. The lead and title track beckons to many other artists throughout the C-jazz world to “step up to the plate” and to the level of this silky and full-bodied charm. No doubt that, in our world of super-competent smooth jazz artists, many will meet that challenge, but you must hand it to Adkins for initiating the call just by producing such a tightly composed album, an album that absolutely serenades the masses with beauty and poise. Truth to tell there is much to admire in this well constructed nine song set and a case in point is the pleasing vibe of ‘49th & Broadway’ that has all the street-wise attitude its title suggests it should. Equally good (and staying with the roadway theme) ‘Highway 12’ is an appropriately free-wheeling number and although ‘A New Horizon’ proves to be an evocatively bluesy gem the feisty ‘Time With You’ has something of a country meets smooth jazz feel to it that works remarkably well. The CD’s only cover version is a sultry take on Sade’s ‘No Ordinary Love’ that first appeared on her 1992 album ‘Love Deluxe’ while elsewhere the opening (and title) tune provides just the right amount of edge to counterbalance Adkins sublimely smooth playing. Talking of edge, ‘The Secret Place’ takes Adkins into somewhat laid back territory where touches of sax from Rick Elliott add some texture and later, when sax duties pass to Rob Holmes, he helps deliver ‘Into The Storm’ which with a tight, ‘in the pocket’ groove is arguably the collection’s best track. However, right up there with it, ‘So Far So Good’ is a splendid slice of mid tempo contemporary jazz played with Adkins’ unmistakably mellifluous style. More about Jim Adkins - He has been recording since 1998 when he released the appropriately titled ‘Just Chillin’ and continued in 2001 with ‘Turning Point’. ‘License To Play’ followed in 2004. Songwriter and guitarist Jim Adkins from Virgina came discussed here in 2008 with his album 'City Streets'. It was fine smooth jazz music, although unknown, he still could compete with the more familiar names. He won 2nd in the 1999 Billboard Song Contest in the jazz category. He owns eight Awards in V(irginia) O(rganization) (for) C(omposers) (and) L(yricist). His music has been heard around the world, from the USA to here in Europe and even in Australia. He mixes smooth jazz with soul, blues and rock influences. He does once again on his 6th album, which are 8 original tracks and one cover. The CD opens with the title track, which sounds smooth and pleasant. The lively and acoustic 'Time With You "follows, and the equally cheerful" So Far So Good "beyond hops. R&B is the inspiration for the relaxed "The Secret Place" followed by the sprightly "49th & Broadway. 'Highway 12' sounds a bit bluesy, and 'Into The Storm' you hear Rob Holmes's sax. This is a relaxing song, one of the best on the CD. Then Jim Covert, Sade's hit "No Ordinary Love" on a guitar with nylon strings. Very nice! The rock-like "A New Horizon" he concludes. Jim certainly knows how to charm with this very interesting contemporary musical journey! 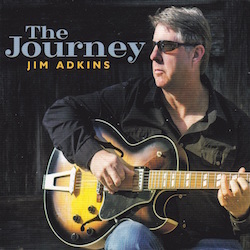 Jim Adkins is one of those gifted, quality musicians whose guitar has that calming tendency while losing none of the tell-tale soulful yet subtle funk that’s often intermixed in smooth jazz in varying degrees. Adkins has the right formula for the mix, and it works every time for me. With a magnetic style, beckoning hooks, and high-end melodies, he is noted for stroking the notes of a well-constructed chord as if he were stroking a delicate flower or a lovely woman. On his latest project, City Streets, the highs, the lows, the midrange are all perfectly calibrated and send forth such magical tone that it’s no wonder that this guy stays at the top of his game with each recording. 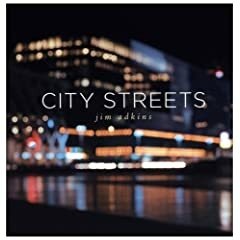 City Streets is truly a continuation of Adkins’ clear insight and vision with respect to the smoothest of jazz guitar. The title and opening track is very indicative of the ride he will engineer when you hear this. This is all so cool-air refreshing, such that it will melt away your cares if only for the lilting time you spend with this recording. You almost have to set aside some Jim Adkins time each day to put things in proper perspective and maybe realize that there is a positive solution to whatever bugs you in your life at the moment. There are several cuts here to absolutely love (I couldn’t find one that begged exception). However, one that simply mesmerized me was “Mystic Vista,” which carries such a heady exoticism about it, even in its moderate tempo cadence, because of its eloquently structured melody, hook, and riffs. In one word: Wow! Then again, you’ll find plenty on this set that strive to rival it, and, in the opinions of many of you, some cuts will rival it. In my eyes, Jim Adkins has easily established himself as a serious force in this genre. In the eyes of his colleagues and fans, he definitely should be there. For smooth jazzers who’ve yet to experience him, I’m sure you will easily place him there after one good listen. Grab this one and covet it as a masterful production from a masterful artist who obviously aims to please. Mid tempo is where Adkins works well and the ultra smooth ‘Lost In The Moment’ is a great example of his art. In fact one delicious tune after another keeps on flowing by and as the dazzling ‘Lost In Love’ gives way to the happy vibe of ‘Feels Good,’ Adkins continues to weave his relaxing web with the very Peter White like ‘After The Rain’. Its languid Latin undertone is totally addictive and Adkins retains the Latin theme for ‘Mystic Vista’ which has all the rhythm and melody you will ever need. Although a little moodier, ‘Out And About’ is no less appealing whilst the albums only cover is Adkins re-imagining of Al Green’s ‘Lets Stay Together’. The fact he caresses this soulful number into a tranquil delight is totally indicative of his style but when with ‘Curtain Call’ he takes the chance to turn things a little bluesy he demonstrates to perfection that he is far from being a one trick smooth jazz pony. Despite that, the evocative ‘Manhattan’ finds him at his very best. Loaded with the understated energy of the place from which the song takes its name, and embellished by cool sax from Rosshan Monroe, it is clearly one of the CD’s outstanding tracks. However, just shading it is the excellent title cut. This superbly tight slice of smooth jazz finds trumpeter Bill McGee (whose own CD ‘Chase The Sunset’ was reviewed in these pages back in January of 2007) in tremendous form while picture perfect playing from Adkins fuses the entire piece together in a joyous way.